Edit: It’s been over 3 years since Starry Horizons was launched. Check out our 6,000 nm review and 20,000 nm review for our thoughts on all this work after 3 years of cruising. Part 1 of our “small projects” completed in Palmetto can be found here: Palmetto Projects Part 1: Lots of Projects. Now on to Part 2. 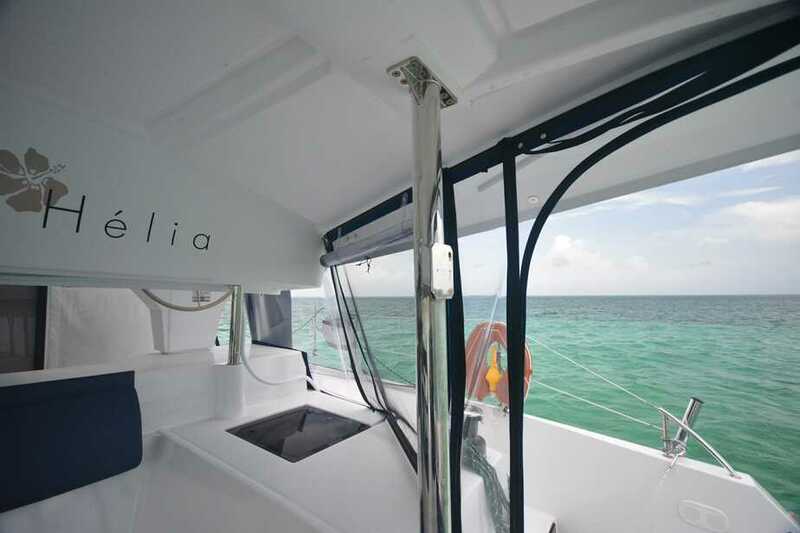 As I touched on in my 6,000nm Helia review, I think the davits on the Helia are too low. 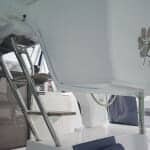 With the standard lifting points in our dinghy, the outboard would hit the davit before the stern could be raised all the way. 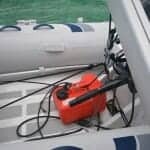 Rather than risk the outboard sitting too low, we stored it in our genset locker for the Atlantic crossing. While we were here, we brainstormed lots of ideas about how to fix this, including doing pretty major surgery to raise the davits, before Amy came up with her brilliant idea. 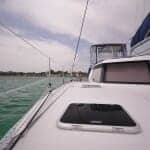 We also discovered, much to our horror at 11pm as we tested out the new system before leaving back to Houston the next morning, that our davits had developed a silence shattering shriek that we were sure woke up the whole marina. The davits are rated for 200kg (~440lbs) and our dingy/outboard setup weighs a little over half that, so there was no way the davits were overloaded. 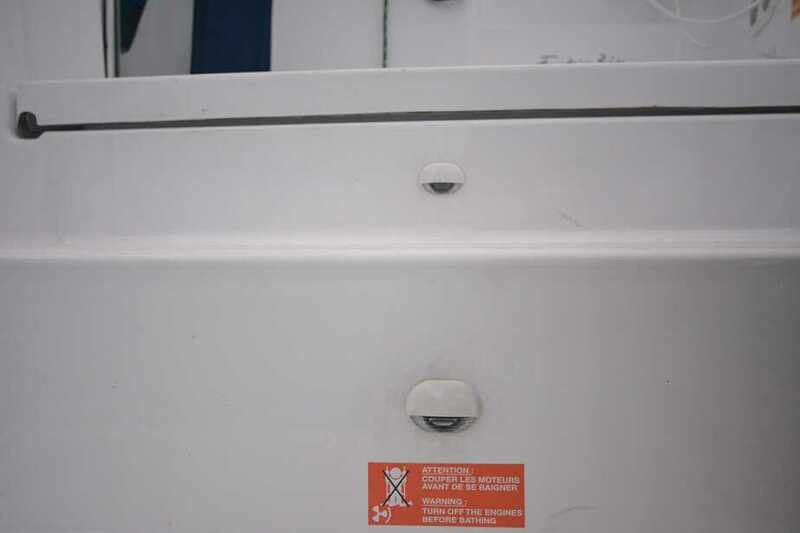 Further investigation revealed that the sheaves in the davits were all made of plastic, so we upgraded these to custom ones made out of aluminum. Presto… noise gone! 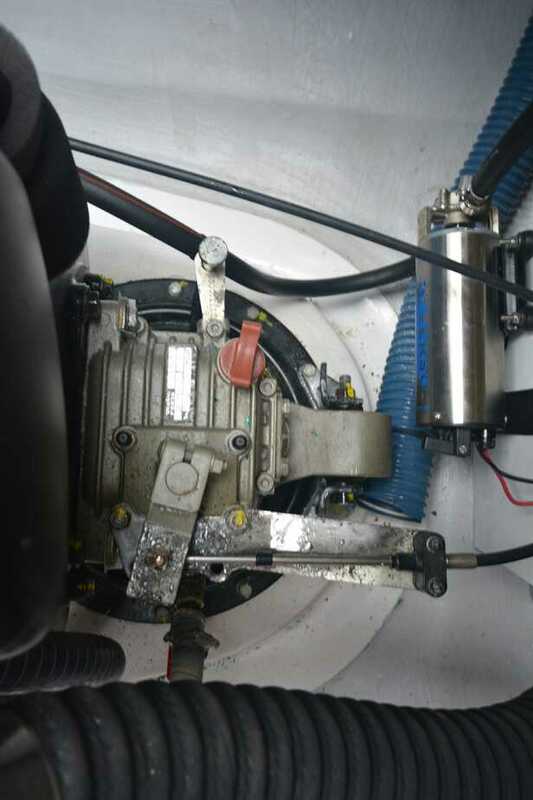 As I also mentioned in my Helia review, I didn’t understand the rationale for where FP put the stern light. It was located inside the cockpit and when in use at night, it lit up almost the whole cockpit! That meant if you wanted to preserve your night vision, you needed to shield your eyes, which isn’t exactly the smartest thing to be doing on a moving boat in the middle of the night when you don’t want to fall overboard. So we took inspiration from another Helia and had a custom bracket made to move the stern light out to the end of our starboard side davit. While we plan on using the tricolor light at the top of the mast (installed in Miami) the vast majority of time while we’re sailing at night, I feel this ‘upgrade’ has vastly improved our odds not being blinded (and thus tripping overboard) and that’s a rather good thing. This is a bit of a teaser for upcoming posts, but part of our desire for the helm hardtop bimini and enclosure was to keep the elements out as much as possible, specifically rain. Unfortunately, FP didn’t really put a lot of thought into keeping rain out of the helm station as all the water collected on the lounge deck was designed to flow down the stairs into either the helm or the cockpit. This would defeat the purpose of an enclosure in my opinion. 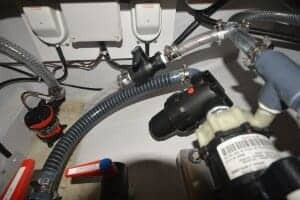 Thus, to solve this issue, we installed a piece of starboard to act as a barrier and a through hull in the lounge deck with the hose led down behind the helm station and outside of the enclosure. The early returns are good and it’s not a visual eyesore, but it sure would have been nice if FP had addressed this from the beginning. 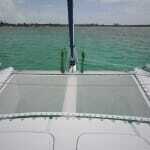 Edit: We removed our boom vang within the first year of cruising. We don’t think it was sized properly and think it was more technical sailing then we wanted to tackel while cruising the world. 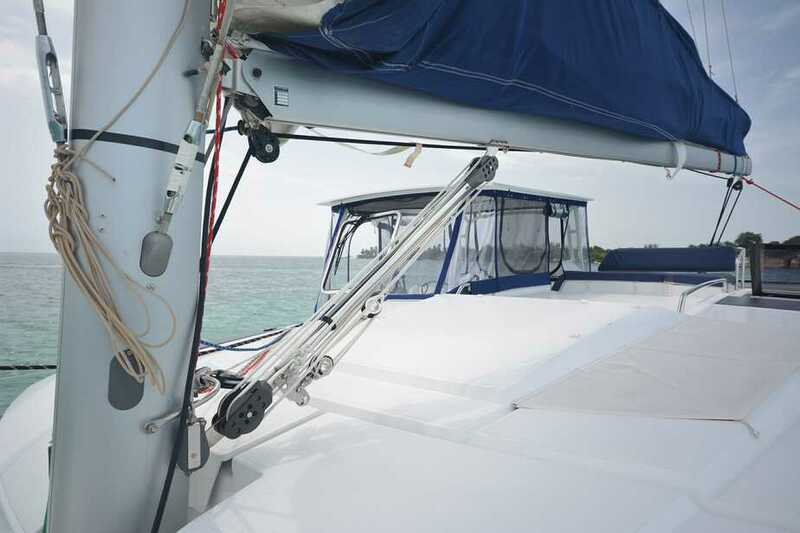 Yet another teaser, as part of the design for our helm hardtop bimini, we decided to raise our gooseneck by 12″. This allowed us to raise the forward edge of the hardtop and give lots of visibility forward, but also gave us enough room to install a rigid boom vang. 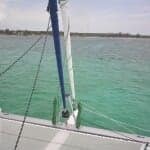 The boom vang is made by Garhauer and we led a line aft that can be used to either crank down on the boom and flatten out (control twist) or let out and put a bit more twist in the mainsail. 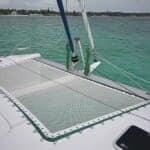 We elected to take out the 3rd reef line from the mainsail (if it’s blowing that hard, we’re just going to drop the main anyways) so we were able to re-purpose the 3rd reef stopper. 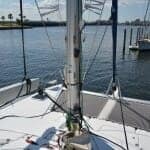 The vang will really prove it’s worth for just about any sailing deeper than 90 degrees, as at that point the traveller is almost all the way out and you can’t control twist with the mainsheet. I wouldn’t categorize a boom vang as a necessity, but I do really enjoy trying to get the boat to perform at it’s peak and being able to control the twist in the mainsail will hopefully give us a bit of an advantage when we’re out racing another Helia! Another advantage is that the vang allowed us to remove the topping lift from the back of the boom. 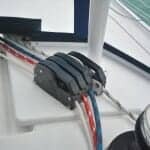 This will give us a spare halyard we can use if anything happens to the main halyard, and also frees up the leech of the mainsail when tacking, so it doesn’t get caught in the topping lift. Teak looks really nice, when it’s properly maintained and cared for. Unfortunately, I don’t really enjoy doing that and there are a lot of other items on the boat that are higher priorities for me. Plus, our teak table is already starting to stain from things spilled on it. 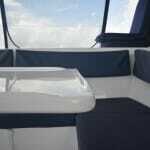 So in the interest of easy maintenance, we had a custom fiberglass cockpit table made up by Mondo Marine down in Bradenton. The table has a lip around the edges which will help prevent things from sliding off while underway, will be much easier to keep clean and will cross one item off my maintenance schedule, which is perhaps the biggest perk of all! Let’s be honest, sometimes there’s nothing better than sitting back with a movie marathon on a rainy day. And on a big boat like Starry Horizons, a small 15″ screen just wasn’t going to cut it. After shopping around, I found a 42″ 1080p LG LED tv on Amazon that was a good deal and consumed a lot less power than other options. The most logical place to mount the TV was on the panel facing the salon couch that had been used as shelving by FP. 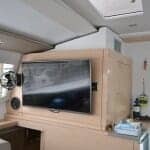 I wanted to mount a swing arm so we could pull the TV out to get a better viewing angle, and then “store” it flush up against the panel so it would be out of the way as we walked down into the owner’s cabin. Only 2 problems with this location. There was a shelf in the middle of the panel. So, since it’s always fun to cut things up (especially when there is no risk of sinking the boat! 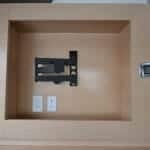 ), I took out the panel, cut out the shelf and mounted the TV using a large backing plate. That thing isn’t going anywhere. 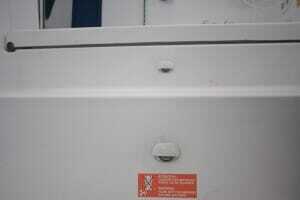 As for the second problem, we had George, our electrician, wire in a new plug into the back of the panel. This worked out great because not only do we plug our TV in here, but we use a power strip and provide power to our wifi router, media server and hard drives as well. 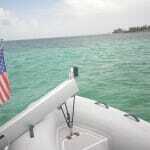 What is a proper cruising boat without a grill? 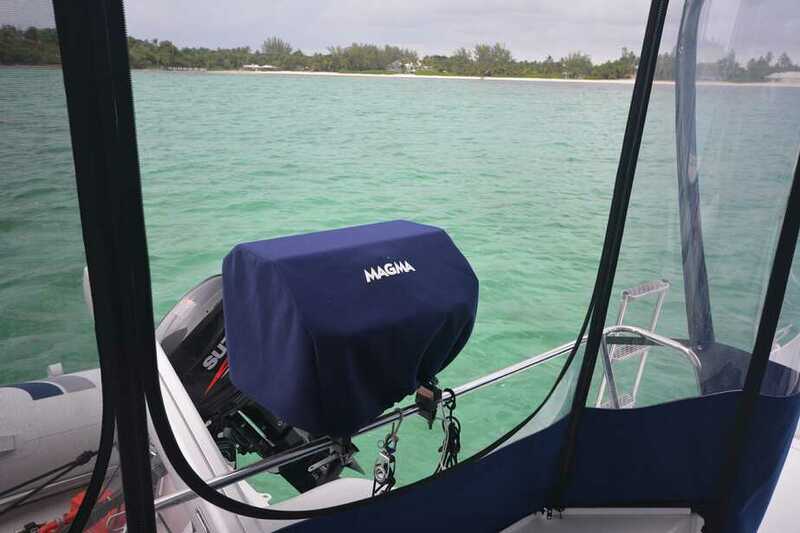 We had ordered our Magma Catalina grill at the Miami Boat Show but waited to install it her in Palmetto when we got the appropriate “extended” legs. This pushes the grill back far enough from the enclosure that we don’t have to worry about melting it. We also designed the enclosure with a big U-Zip to provide easy access to the grill. For the time being, we haven’t hooked the grill into our regular propane system and are just relying on the small green propane bottles. Tying everything in together is something we may revisit at a later date. Take special note that the Owner’s Manual listed the main halyard at 55m, but when I measured the factory line, it was actually 63m! 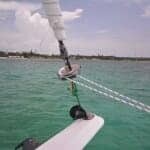 And of course, this was discovered after we had already run the new halyard through the mast. The old sheets had been used for various purposes around the boat, including as an emergency dockline when the weather got rough in Las Palmas so it was worth getting new sheets. We ordered three 45′ lines that will be used as additional dock lines, as well as lines to pick up a mooring ball. Our old genoa sheets have been re-purposed into dock lines as well. As I’ve mentioned multiple times, I’m not a big fan of having to go forward while under sail, especially to put in a reef when the boat is bashing into waves. 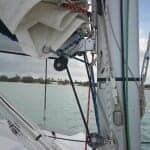 We ordered the boat with a single line first reef, but the second reef required me to go to the mast, feed a strap through a cringle in the sail and then attach said strap to a snap shackle on the mast. 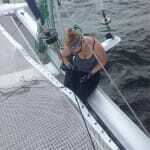 This process involved a lot of unsexy grunting, groaning and swearing while holding on to the boat as she behaved like a horse spurred out of the shoot. Not fun for anyone involved. Since we decided to take out our third reef line, we had some extra room for more line in our helm storage bin and decided that a single line second reef would be just the thing to take up the additional space. 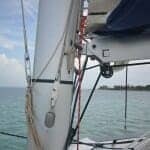 I lashed a low friction carbon ring to the cringle at the second reef point in the mainsail, as well as an additional ring on the mast to help pull the line forward before it runs down to the blocks, making the turn back to the helm. I also had to re-run the line through the boom so that it comes forward under the sheave at the gooseneck and then runs up to the ring, rather than coming over the sheave and straight down to the blocks leading back to the helm. 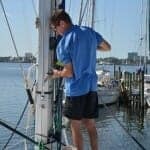 When we arrived in Florida, we noticed that we had a lot of corrosion in our engine compartments, specifically the aft end over the sail drive. I suspected that water from the few waves that rolled up our transom steps, or from spray had gotten through the LED courtesy light “covers” on the steps. To confirm we had to do what I believe is Amy’s favorite experiment on the boat. I got down in the engine compartment while she locked me inside and got the hose. (I think I heard a bit of gleeful laughing at this point) She then proceeded to spray the hose at all possible points of ingress into the engine compartment. We discovered that the hatches were sealed tight, but that water was definitely leaking in through the light covers. I took the covers off, added some silicone to where the legs of the cover inserted into the base and voila, no more leak. However, that didn’t fix the issue of the corrosion we’d already experienced, so we purchased some Rust Bullet coating. Amy spent a couple days in the engine compartments and generator locker scrubbing down things with corrosion and applying the Rust Bullet coating. Hopefully, this will help prevent any future corrosion but we’ll definitely be keeping an eye on it. 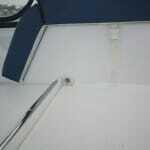 We knew that we were going to replace the trampoline on the Helia even before we signed the contract for our boat. 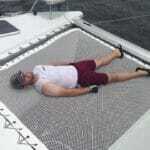 The factory one was too “stretchy” and the open weave wasn’t comfortable for us to lay on. 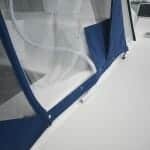 We decided on a 3/8″ hole, Polyester Open Net from Multihull Nets after consulting with several other cat owners. After actually receiving the boat, I submitted the measurements needed to start construction and the trampoline was ready for us when we arrived in Florida. Eventually, we did get it installed and we’re much happier with the new trampoline, although the “no jumping” on the boat trampoline will still remain in effect. 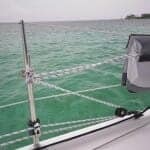 You can read all about our adventures in trying to downsize our anchor chain in this post. 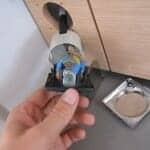 So instead of having to do this fix forever, I cut into the line leading to the air conditioner and added a tee with the additional hose having a ball valve that can easily be opened when I need to bleed the system. Much easier. We probably should have expected this given we ordered an American style power boat from France, but it turns out they wired all of our 110v plugs incorrectly. The polarity was reversed and this caused some issues with some equipment we had on board. Our electrician George did some testing, told me how to fix the issue and I fixed all the plugs myself. 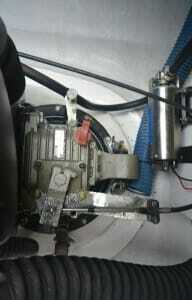 Since the boat is wired using European color conventions, all that was necessary was to swap the hot (brown) and neutral (blue) wires on each plug. Once that was done, all our 110v equipment worked properly! 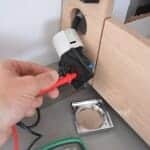 This article does a good job explaining how to test for reverse polarity. 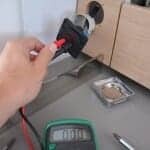 Large Opening + Ground with no Voltage = Correct! That wraps up part 2 of our Palmetto Projects! 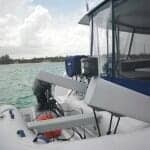 Stay tuned for part 3 about our custom helm hardtop and enclosure. After reading all of the improvements and upgrades to your Helia, I was wondering if you shared these with the manufacturer. 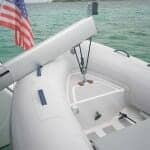 Where some of the items you’ve performed are definitely for the new owner to tackle, many seem like FP could have included, or accounted for when manufacturing the boat. We’re very lucky to have a good relationship directly with FP and have suggested some of the things we’ve done to them and provided our feedback about items we’ve changed. 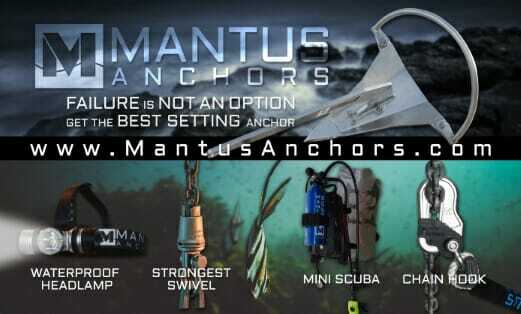 Some of those have been addressed on the new Helia Evolution (the davits being a huge one)! a lot of great improvements!